Red Bull unveil the car they will be using to defend their world championship title in a ceremony at their Milton Keynes factory. 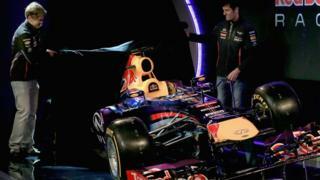 The RB9 was revealed by the team's drivers, world champion Sebastian Vettel and Australian Mark Webber, who continue their partnership into a fifth year. Also on hand at the launch was the car's designer, Adrian Newey, who hopes the RB9 will become the latest car to add to his tally of nine constructors' titles.